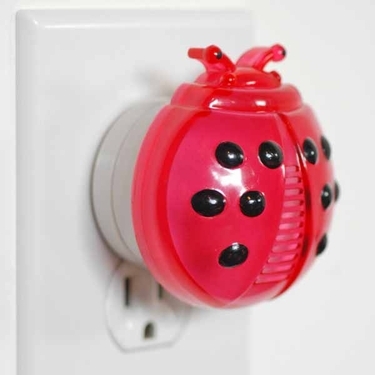 Avoid using dangerous poisons or unsightly traps in your home - use this charming dual-functioning Ladybug ultrasonic pest repeller & night light to send silent sound waves that help repel insects and rodents. This pest repeller has a stay-cool long lasting LED night light that automatically comes on at dusk, and gradually glowing brighter as the room gets darker. Designed to protect an average-sized room, this ultrasonic pest repeller won't affect people or non-rodent pets. We love these small units because they are silent, incredibly simple and portable. You simply plug it in to any outlet and you are done. The unit is ultrasonic so you do not hear anything. It is kid safe and pet safe, and comes in a few different designs for whimsical fun. No smells, no chemicals, no poisons, and no real obvious evidence you are using a device to thwart bugs and rodents - it just looks like a simple night light. For maximum effectiveness, use one unit per room - larger rooms may require multiple units. Plugs into any unobstructed 110V AV wall outlet. Silent, and costs less than a penny a day. Economical and long lasting Ladybug LED night light.